Everyone knows the legend of the Jersey Devil. Some believe it is an abomination of nature, a hybrid winged beast from hell that stalks the Pine Barrens of southern New Jersey searching for prey. Others believe it is a hoax, a campfire story designed to scare children. But one man knows the truth . . .
Sixty years ago, Boompa Willet came face to face with the Devil—and lived to tell the tale. Now, the creature’s stomping grounds are alive once again with strange sightings, disappearances, and worse. After all these years, Boompa must return to the Barrens, not to prove the legend is real but to wipe it off the face of the earth . . .
It’ll take more than just courage to defeat the Devil. It will take four generations of the Willet clan, a lifetime of survivalist training, and all the firepower they can carry. But timing is critical. A summer music festival has attracted crowds of teenagers. The woods are filled with tender young prey. But this time, the Devil is not alone. The evil has grown into an unholy horde of mutant monstrosities. And hell has come home to New Jersey . . .
Let me begin this review by saying that I LIVE in the Pine Barrens. In fact, I know pretty much each and every location mentioned in this story. I have camped at Brendan Byrne, I have hiked the trails of Wharton. I know the legend of the Jersey Devil quite well, and I know just how creepy these woods can be at night. That being said, I was fully intending to hate this story. I felt there was a solid premise, but I never expected it to live up to the promise I saw in it. This was one of those stories that takes a well known concept (in this case the Jersey Devil) and completely makes it their own. They forced the reader to live in the moment with them, throwing one thing after another at you until you found yourself up hours past the time you would normally be asleep just to find out what happens next. And it wasn't just the plight of the main characters that kept your attention, the author added copious details of the other poor souls that ventured into the Devil's territory - and lost. While we're on the subject of poor souls, the addition of the "mutant monstrosities" also gave this story a depth I wasn't expecting. They presented not only a new problem, but a new set of questions that the reader was forced to consider. What if this were possible? By now you may be asking yourself if I liked this story so much, then why did I only give it 4 stars? Well that is because of my ONE complaint - there were so many characters in this story that they sometimes blended together and I had a hard time remembering just who was who. Overall, I believe this story will appeal to a wide variety of people. 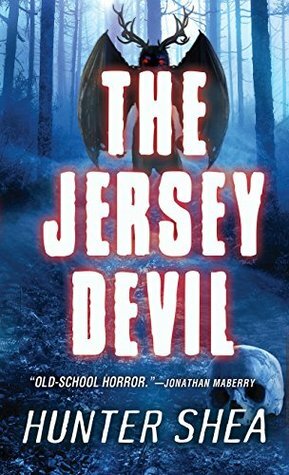 Those who love horror novels, those who are looking for a new take on the Jersey Devil legend - both will enjoy this gripping and fast paced story!